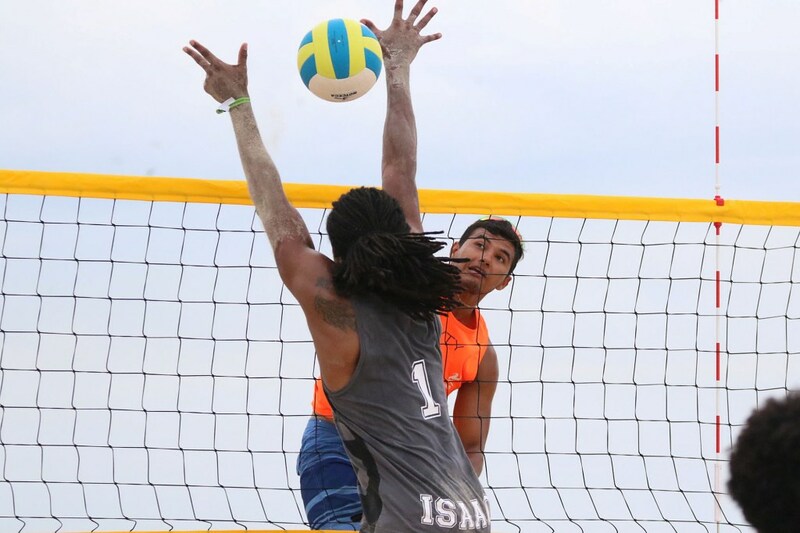 BOCA CHICA, Dominican Republic, October 5, 2018 – Pool E of the Boca Chica Beach Volleyball Tournament will be decided with a clash between Mexicans Josue Gaxiola and Jose Rubio and Erick Zaun and James Avery Drost of United States after the two pairs each won two contests of Friday. Gaxiola/Rubio won 2-1 (23-21, 18-21, 15-9) over Puerto Ricans Encarnación/Ribas and 21-12, 21-12 against Isaacs/Wilson of Bahamas. Zaun/Drost defeated the Puerto Ricans 21-16, 21-17 and the Bahamians 21-8, 21-13. Meanwhile, Cubans Karell Peña and Luis Enrique Reyes, winners of the Punta Cana tournament last week, also obtained two victories in men’s Pool F in the opening day in the Boca Chica. Peña/Reyes will go for the top place of the group when they meet on Saturday with the duo of Carlos Escobar and David Vargas of El Salvador who left Friday with a 1-1 record. Peña/Reyes claimed wins over Theodore/Waldo of Trinidad & Tobago 21-19, 21-9 and Fransua/Anthony of Aruba 21-16, 21-11. The winners of Pools B and C in the men’s event will be decided with do-or-die matches on Saturday morning. In Pool B, Canadians Sam Pedlow and Sam Schachter will challenge Daneil Williams and Daynte Stewart of Trinidad & Tobago, while in Pool C William Allen and Ryan Doherty of United States will battle Andy Leonardo and Luis García of Guatemala. In Pool B, both teams scored victories over Noley Ferguson and Tristan Hitchman of Jamaica with Pedlow/Schachter winning 21-13, 21-11 and Williams/Stewart dominating 21-11, 21-10. In Pool C the losers were Lesniak Dillon and Smith Hylas of U.S. Virgin Islands with Allen/Doherty winning 21-12, 21-10 and Leonardo/Garcia prevailing 23-21, 21-19. In Pool A, Canadians Ben Saxton a Grant O’ Gorman (1-0) will go against Shawn Seabrookes/Rohan Jeffers of St Kitts & Nevis (1-1) while in Pool D Nicaraguans Ruben Mora and Dany Lopez (1-0) will play Dominicans Jamel Jeambatis/Alex Medina (0-1). Pool A: COL d SKN 2-0 (21-9, 21-16), CAN-A d COL 2-0 (21-14, 21-11). Pool B: TTO-A d JAM 2-0 (21-11, 21-10), CAN-B d JAM 2-0 (21-13, 21-11). Pool C: GUA d ISV 2-0 (23-21, 21-19), USA-A d ISV 2-0 (21-12, 21-10). Pool D: NCA d CRC 2-1 (21-19, 18-21, 15-13), CRC d DOM 2-0 (21-17, 21-13).Pool E: USA-B d BAH 2-0 (21-8, 21-13), MEX d PUR 2-1 (23-21, 18-21, 15-9), USA-B d PUR 2-0 (21-16, 21-17), MEX d BAH 2-0 (21-12, 21-12). Pool F: ESA d ARU 2-0 (21-8, 21-15), CUB d TTO-B 2-0 (21-19, 21-9), TTO-B d ESA 2-1 (19-21, 21-16, 15-11), CUB d ARU 2-0 (21-16, 21-11).